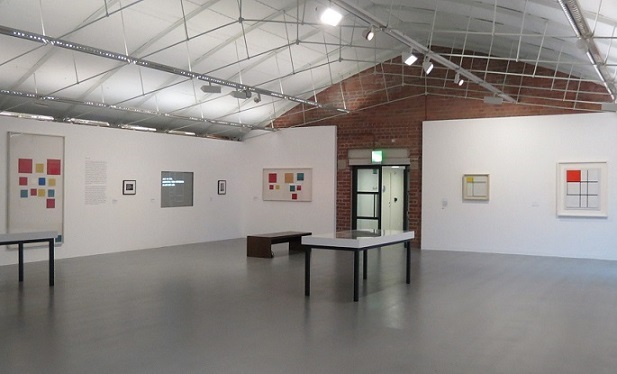 Mondrian and his Studios at Tate Liverpool commemorates the 70th anniversary of the artist’s death and provides new insights into the artist’s practice, his relationship with architecture and urbanism, and his contribution to the development of modern thought. The exhibition presents the largest number of neo-plastic paintings by Mondrian ever assembled in the UK, with some never before seen in this country, focusing the connection between painting and architecture after Mondrian’s move to Paris in 1911. Mondrian and his Studios features many of Mondrian’s best-known neo-plastic works alongside a life size reconstruction of his studio at 26 Rue du Départ, Paris by Frans Postma ; while in the last room are exhibited the works that Piet Mondrian produced in New York; his last studio in the 15 East 59th Street is documented in the exhibition through archival material, documentary photographs, a 1944’s film by Harry Holtzman and the Wall Works. These compositions, created by Piet Mondrian on the walls of his Studio with coloured cards, some of which painted by him, are those found composed at the moment of his death, and were transferred and remounted, by Harry Holtzman, after being meticulously traced, in order for them to be preserved and exhibited. While the framing and the selection of material to use as support of these original cards compositions were carefully chosen by Harry Holtzman, the relationship between the colours of the cards and the spacing between them, preserved and recorded by the tracing, document exactly what Piet Mondrian composed on the walls. With the photographs and the film , these two compositions – part of a group of eight – preciously document in Liverpool Mondrian’s last studio in New York, which has also been exactly reconstructed by the architect Jason Holtzman in several previous exhibitions. 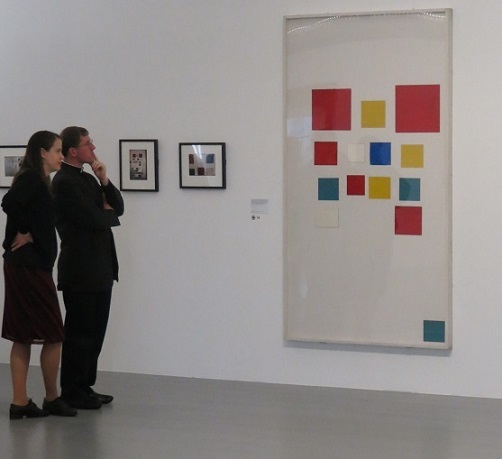 In addition to Mondrian and his Studios at the Tate Liverpool,the Turner Contemporary Margate, Kent in the U.K., is presenting the exhibition : Mondrian and Color, which was developed in collaboration with the Bucerius Kunst Forum, Hamburg and runs from 25 May to 21 September 2014. This exhibition explores Mondrian’s use of color from his early figurative work to the later abstract works. The exhibitions coincide with the 70th anniversary of the death of the artist.